How to tie a Clinch Knot. In recent years the original Clinch Knot has been supplanted to such a degree by the "Improved Clinch Knot" that the regular old Clinch has fallen by the wayside for many anglers. 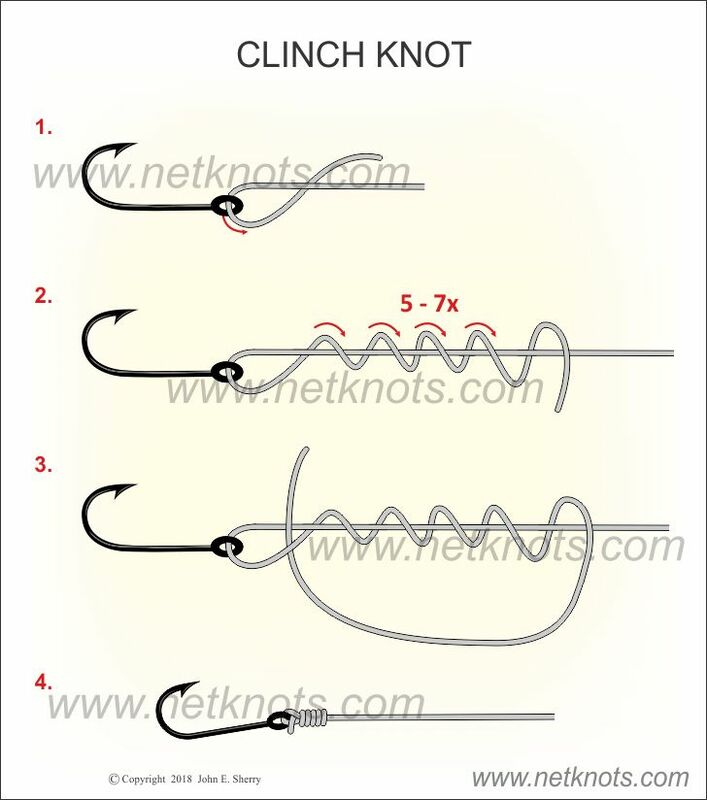 Anglers even refer to the improved version as the "Clinch Knot" and a Google search mostly brings up results for the improved version. So, does the good old Clinch Knot warrant a place in an angler's arsenal of knots? Many fly fishing guides will say "Yes!" and use the Clinch throughout their day of guiding guests. First and most importantly, they trust the knot to be reliable. And second, they can tie it very fast (see animation below for their speedy method of tying) which results in more fishing time for everyone, which in turn means more catching! Where the Clinch Knot can really speed up re-rigging is in the fly fishing application of using a two-fly rig. The top fly goes on quickly with the Clinch, then a dropper line is tied to the fly's hook by making a loop on the end of a piece of tippet (with the Clinch) and securing that to the top fly's hook. Then the bottom fly goes on with another Clinch. Three regular Clinch Knots, tied with the rotating finger method probably takes half the time of tying those three knots with any other knot. Just make a minimum of five twists and with light line make seven or eight and the knot is plenty trustworthy. Scroll down to see the Animated Clinch Knot below the knot tying tutorial. Feed the line through the eye of the hook, lure or fly. Double back parallel to the standing line and pinch the two lines together with thumb and forefinger of right hand. Insert index finger of left hand (Feel free to reverse hands in steps to and three if you are left handed.) and begin twisting to put about seven twists in the line below the hook. Feed the tag end back up through the opening behind the fly or hook. Moisten the lines and pull the knot tight. Optional Dropper for fly fishermen: Skipping step one above, use the same method to create a loop and slip the loop over the first fly's hook and pull tight.